To mark BIICL's 60th anniversary, we are launching a special appeal to raise funding for the much-needed refurbishment of our public event and office space. We are delighted that Lord Neuberger has agreed to lead this appeal, alongside a panel of senior figures from the legal sector, academia and business. 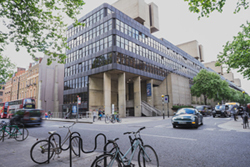 BIICL's central London offices are located in a Grade II* listed building which has had no major infrastructure improvements since it was built in 1976. We plan to refurbish and reconfigure the space to provide a more modern, efficient and professional working environment and improved event facilities. It is estimated that the total cost to BIICL will be in the region of £1.5 million. Whilst we are able to draw down some funds from our reserves, we need to raise at least £500,000 in the next 12 months. We are inviting individuals and organisations to support our Anniversary Appeal and welcome donations at all levels. UK taxpayers can increase the value of their gift by 25% by signing a Gift Aid declaration. All donors giving £1,000 or more will be acknowledged on our donor board and in our Impact Report. For those able to make more substantial gifts, special recognition will be given including naming opportunities and invitations to exclusive events. If you would like to discuss how you or your organisation could support our Appeal, please contact Florence Skinner, Development Manager. Alternatively, you can donate via the links below.